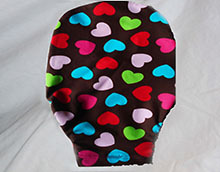 Ostomy pouch covers FloriLeeTM for ostomates, colostomy, ileostomy, urostomy. Manufactured according to the industry standards double insulation cotton polyester skin protection, 2cm building starched to the central opening, which allows the pouch to keep its shape. 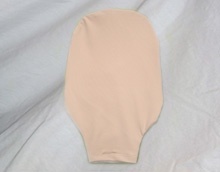 Top Lycra ® stretch knit beige pink. No seams against the skin, designed for all types of ostomy bag. Size: 15 cm wide by 25 cm long. Available in 3 different openings, small 50cm (1 3 / 8”-1 ½”), average 60cm (2”-2,1 / 4’’), 70 cm wide (2 1 / 2”- 2 ¾”).